This is my new felt toy made for my ocean theme collection. He is modeled after a blue-ringed octopus. A blue-ringed octopus is a very poisonous creature and at first I thought maybe it was a bit misguided to make a cuddly toy version of it. After a little more thought, I decided many, many toys are constructed to resemble dangerous animals and that part of the fun of animal toys is the fact that you could never pet or snuggle with one in real life. So in the fashion of the monstrous grizzly turned teddy bear or the unpredictable monkey morphing into a laughable, mischievous, cuddly friend. 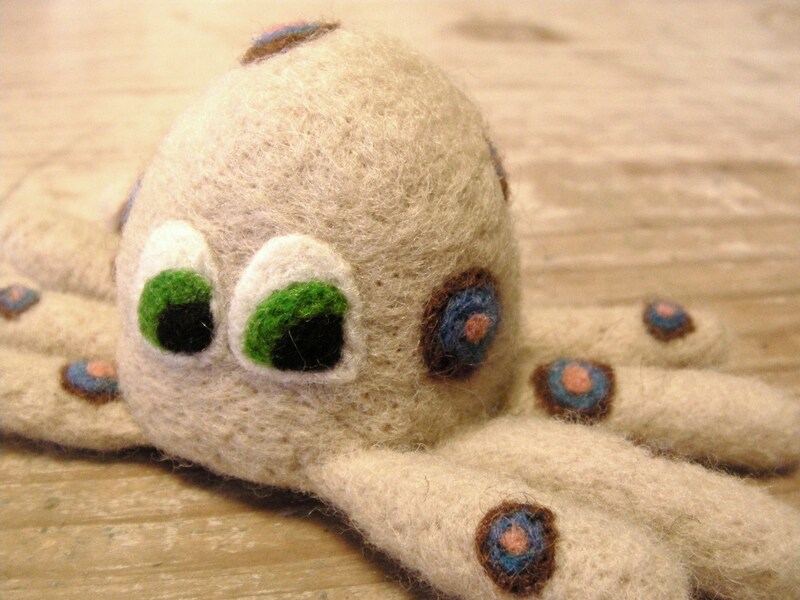 I bring you the most venomous octopus crafted into a sweet, meek, soft felt toy. In real life this golf ball sized octopus could land you in the emergency room or worse. Because, I am a mother, I think it is best to use these little soft versions of “very dangerous if provoked” creatures as a medium to teach your little ones about the world around them. So with that inspiration in mind, I will share what I’ve learned about this amazing octopus. He is home in the South Pacific Ocean from Japan to Australia; but mostly, he is found around southern Australia. His blue rings become more visible when provoked; so even an inconspicuous octopus you need to be wary of because once those blue rings reveal themselves the bite is coming! When you are bit, paralysis will set in quickly(body and respiratory); artificial means of respiration are required within minutes and must continue until the paralysis subsides. There you have it; this octopus like many other creatures in nature is very poisonous but yet very visually appealing. I really wanted an octopus in my ocean collection and the bright vivid nature of this one really caught my eye. I think in toy form, he is cute, adorable, soft and snuggly. Just don’t snuggle the squirmy guy in real life!